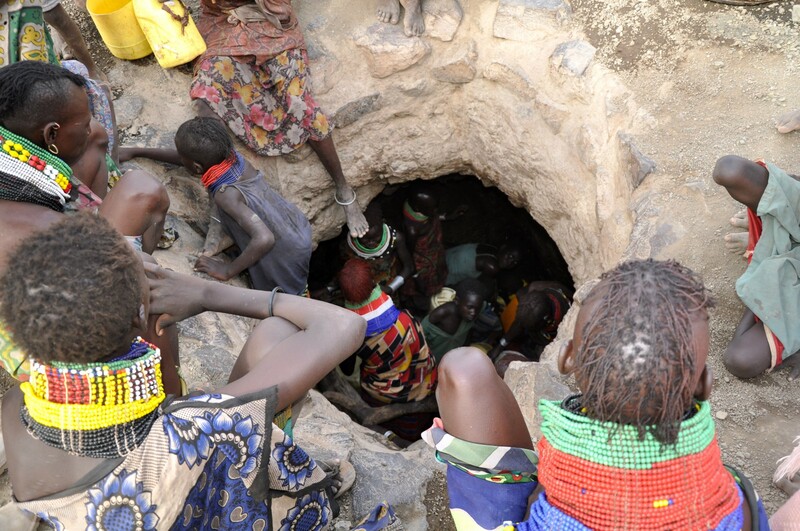 Communities are having to dig dangerously deep to find clean water. Atir Barebur is scared. Scared for her two children. Scared for her people. Things are becoming desperate. Already, Atir’s village more resembles a mining town than a tiny settlement in rural Kenya. The landscape surrounding Karebu village is pockmarked with enormous pits and craters where locals have hollowed out bores in the search for water. 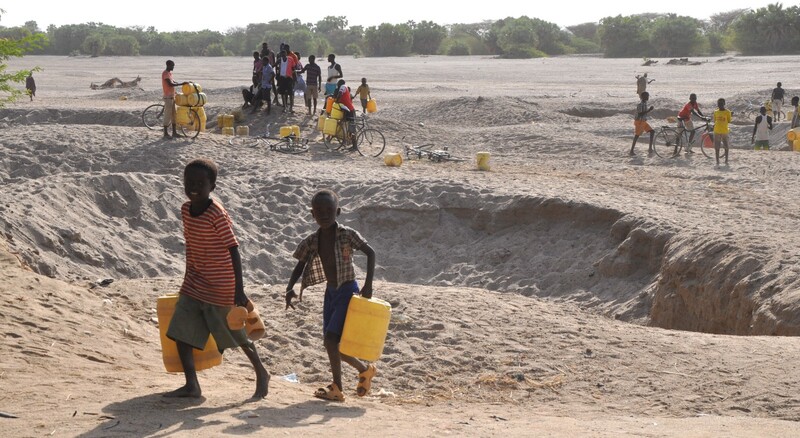 Children collect what water they can from excavated boreholes. Children scrabble deep underground, passing buckets and canisters back up to the surface. Some of them drink deeply, not knowing if it will make them sick. The demand for water is relentless. Besides herself and her children, Atir must water her goats with what the containers bring to the surface. Villagers have had to dig deep into the ground to reach water. 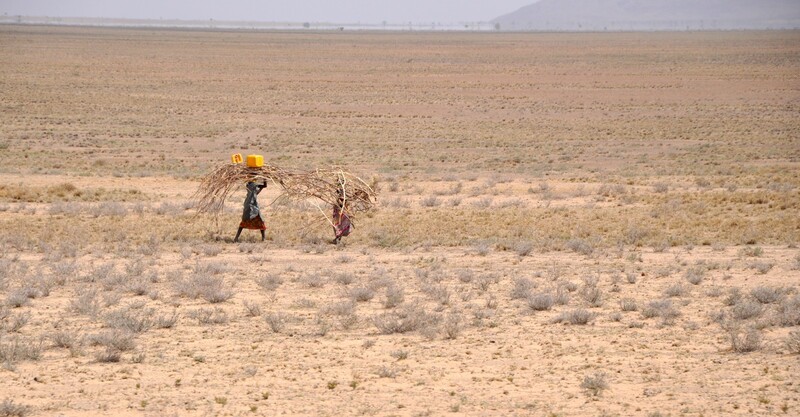 Kenya is one of a number of countries throughout the Horn of Africa facing a growing threat of famine. More than 20 million people are at risk. While conflict and displacement is fuelling the crisis in some of those countries, in Kenya, it is a long and a vicious drought. 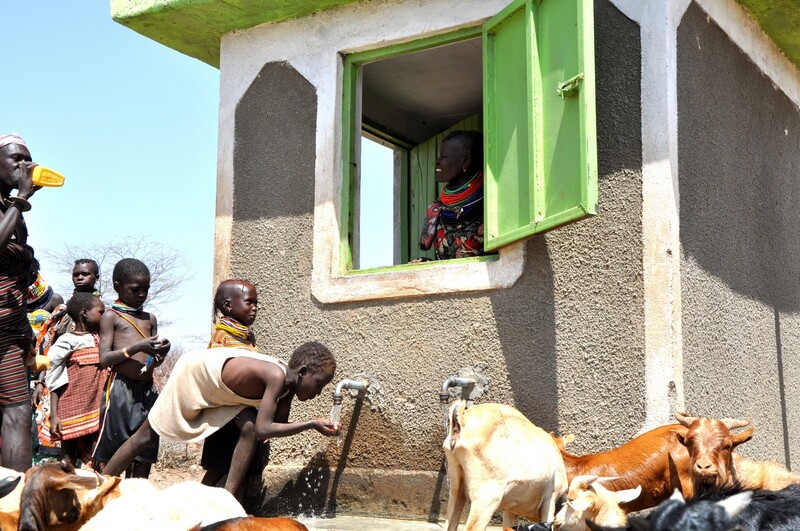 As the drought bites harder, communities throughout Kenya’s Turkana region are being forced to seek alternative, and often dangerous, ways of accessing water. With wells and boreholes drying up, crops are dead, animals are dying, and without a secure supply of clean water, people won’t be far off. Many of the families here are pastoral. 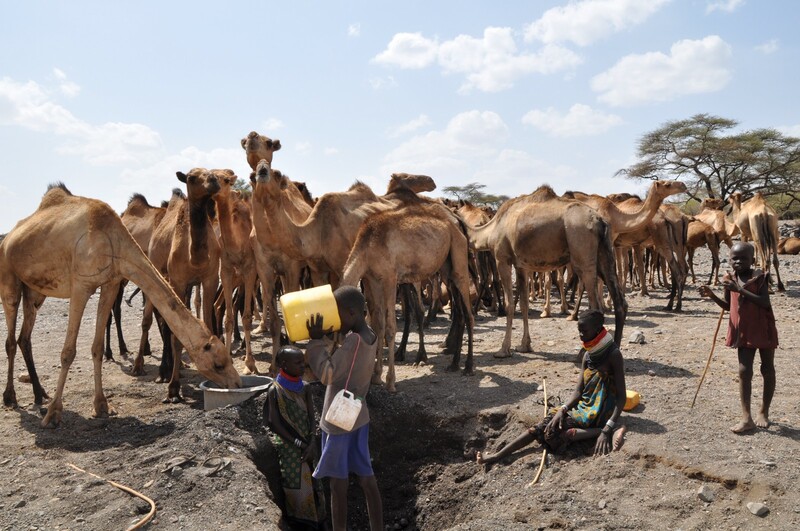 The people living on Turkana’s plains drive their animals to wherever they can find water, sleeping in simple shelters made of scrub and branches. The water source they seek are increasingly few and far between. With wells and boreholes drying up, crops are dead, animals are dying, and without a secure supply of clean water, people won’t be far off. Herdsmen sit around the pits dug into the ground, sharing a drink with their goats or camels, not knowing how far away the next drink may be. Children quenching their thirst alongside their camels. The carcasses of animals that weren’t so lucky are never far away. Karebu villages water source is not necessarily a good one, but people still travelling up to seven kilometres to draw water from it. Many will soon become ill, but they have little option — they either drink dirty water, or die of thirst. These communities have existed in this harsh environment for tens of thousands of years, but even the most resilient communities have a breaking point. A family walks home with supplies from a drought outreach site. The women of one village sing, but not for joy. To try and ease the crisis UNICEF is rehabilitating boreholes, installing pumps, and trucking enormous quantities of safe water to remote schools and communities. At pumping stations adults, children, and goats alike gather to drink safe water straight from the tap. Such efforts are helping, but for every issue tackled, another emerges. Children get in before the goats at a UNICEF rehabilitated borehole. 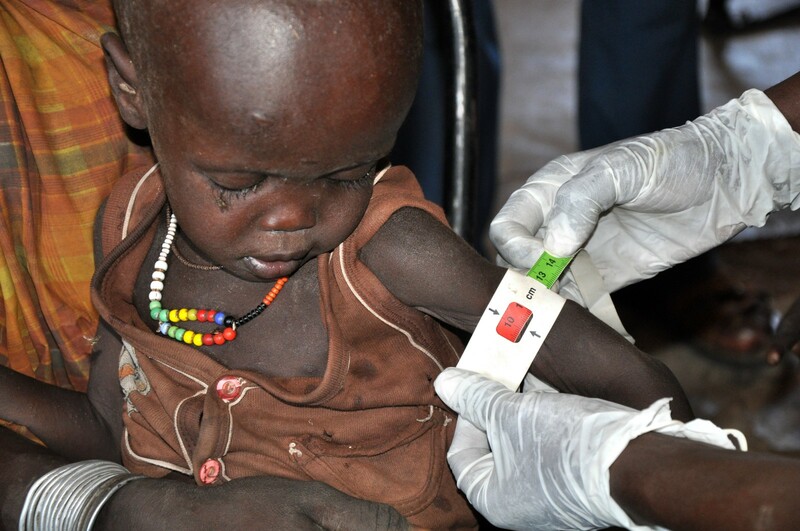 At one clinic, a health worker runs a measuring tape around the upper arm of a young boy. It reads ten centimetres — roughly the circumference of two adult fingers. The boy is extremely malnourished, and needs urgent treatment. “There is starvation in my family, we don’t have food, sometimes we survive on the wild fruits and it is very difficult for the children,” says his mother, Auron Iokoria, who battles to keep him healthy. 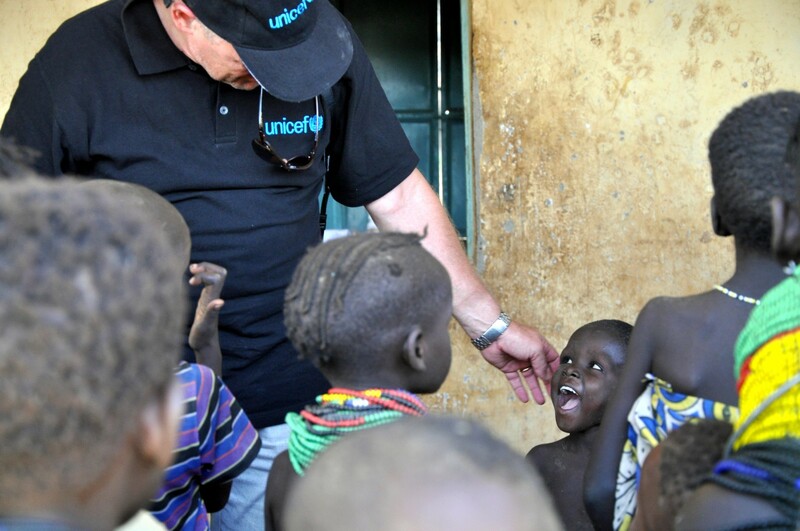 UNICEF’s Kenya representative, Werner Schultink, says more than 50 per cent of the region’s children under the age of five are acutely malnourished. Without a massive influx of international aid, that number will rise, and children will die. Without a massive influx of international aid, that number will rise, and children will die. 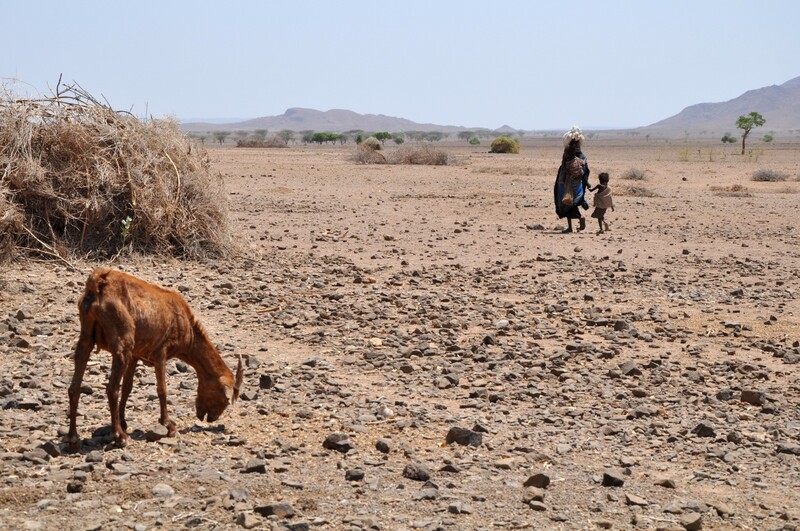 “Because the rains have failed not once, not twice but at least three times, these very resilient pastoralist communities have basically run out of resources to cope with the situation,” says Werner. 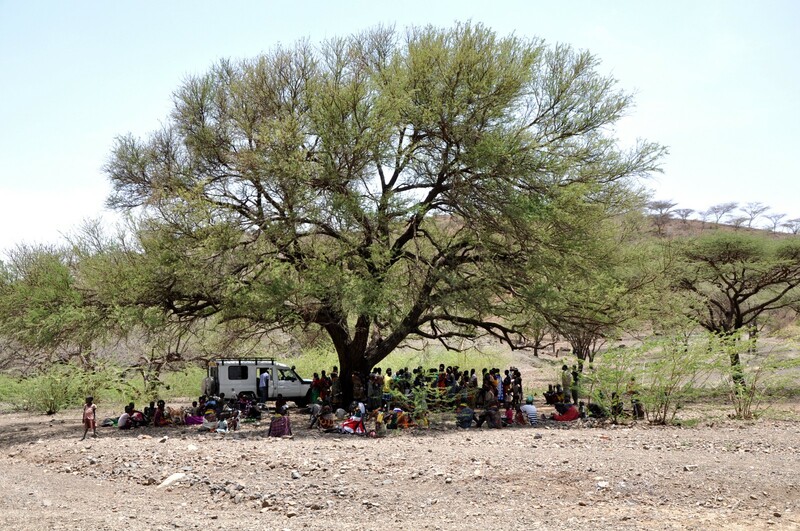 At one site, under the shade of a tree, children sit with their parents, having been given enough food to help keep malnutrition at bay. The rains have failed not once, not twice but at least three times. These very resilient pastoralist communities have basically run out of resources. A young child stands with a sachet of Plumpy Nut, licking their fingers. They are like any child, anywhere around the world, trying to make their treat last as long as possible. A sachet of Plumpy Nut is packed with enough nutrients to keep a child alive. What is needed here isn’t hard to provide. It is clean water. It is nutritious food. It is safety. It is providing the most simple of things to ensure that people like Atir can live healthy lives, and that they don’t have to scrabble in the dirt for water, and that they no longer have to be scared about whether or not their children will be ok.